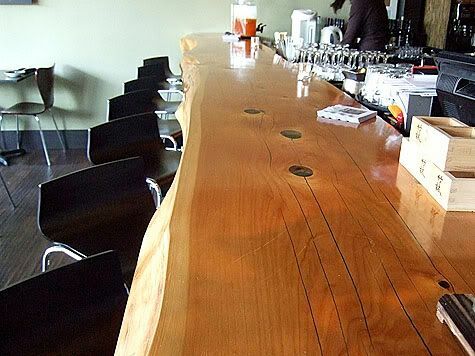 The word namu means wood or tree in korean, and references a cypress tree from golden gate park that was used to create the long dramatic counter of the bar. My friend TK sent me an email asking if I had heard of this restaurant, and I jumped at the chance because I have been wanting to try this restaurant for a while. 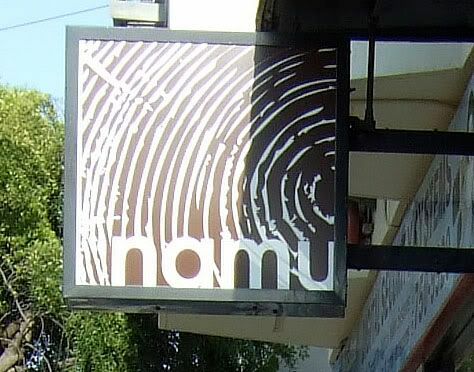 I live in the East Bay and don’t often travel over to the inner Richmond, but there I was walking up to Namu, which is on Balboa, between 5th and 6th, about two doors down from Muguboka, which I visited the week before. 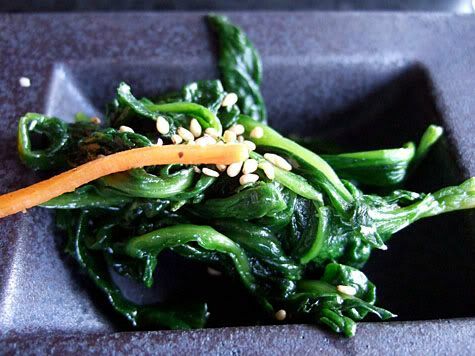 The cuisine is inspired by korean and japanese ingredients and techniques, which is demonstrated very clearly from the complimentary banchan plate. 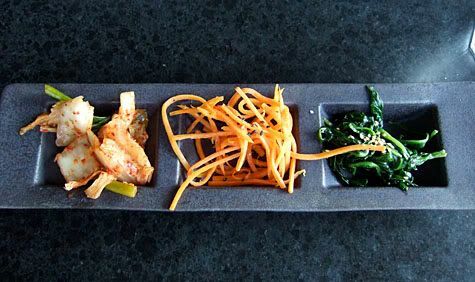 Three small dishes to wake up your tastebuds: Korean kimchi, Japanese style marinated carrots and steamed spinach with sesame seeds. They charge $3 for additional plates if you so desire. The serving plate provides a dramatic background to the bright vivid colors with an eye to the stark simplicity of Japanese design. 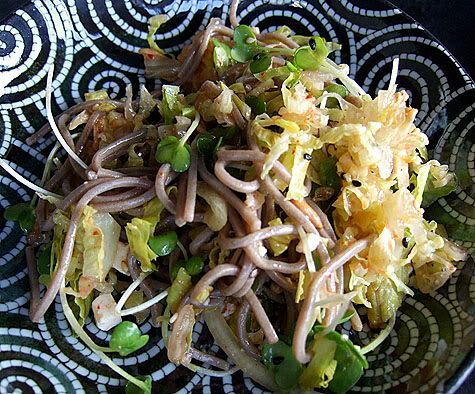 We split the bi bim kooksoo salad, which is based around cold soba noodles, mixed in with chopped romaine, kimchee, pine nuts, tofu, kaiware, and cucumber. 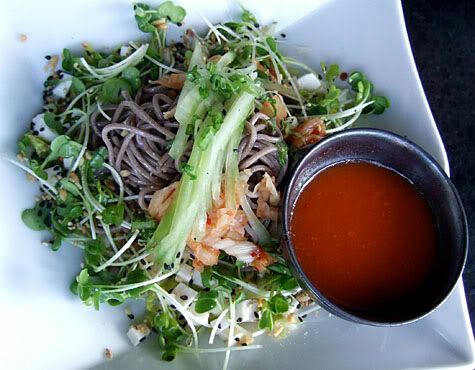 It is tossed at the table with kimchee sesame dressing. The dressing is pungent with garlic and chilies which tantalize your tastebuds along with the variety of crisp and fresh vegetables and nuts. 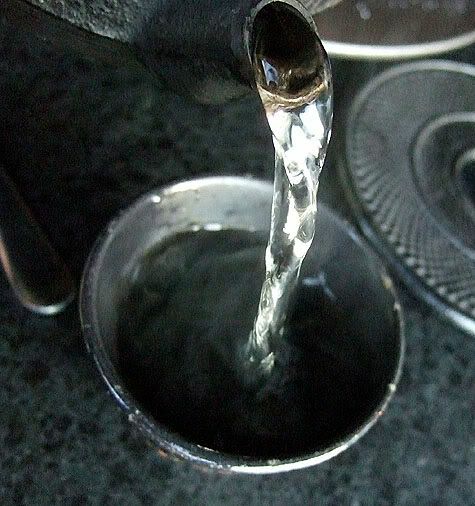 It’s light and refreshing. 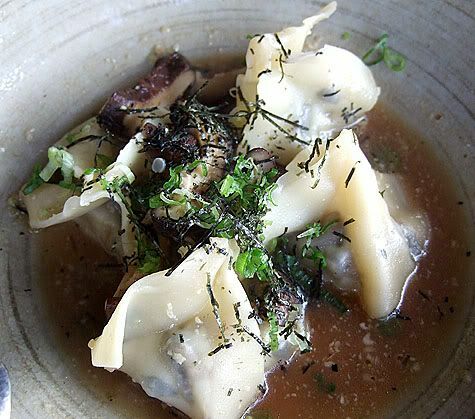 I read good things about the shiitake dumplings in a dashi mushroom broth which were plump and delicious in handrolled wrappers. The broth was savory and very garlicky. 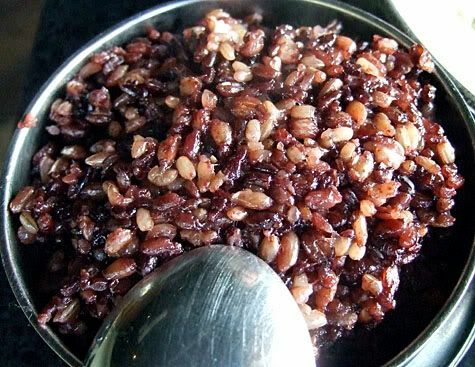 We decided to split one order of the Korean brown rice, which was a gorgeous mahogany color with a dense chewy texture and nutty flavor. 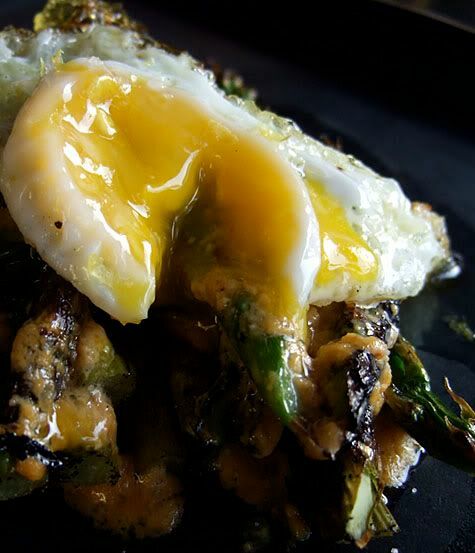 Grilled Asparagus, drizzled with uni-butter, lemon zest and topped with a poached quail egg. This was an exquisitely small dish for over $10, but I suppose that must be from the sea-urchin… to help give you some perspective, the yolk is about the diameter of a nickel. 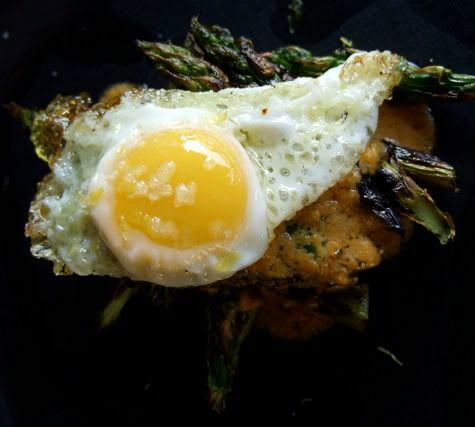 The server advised us that we should mix the egg in with the asparagus to add richness and to balance the bitterness of the asparagus. 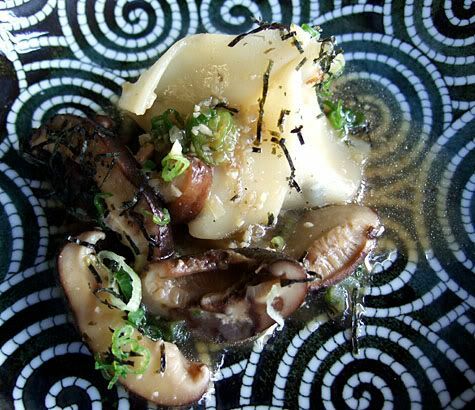 The egg mixed with the uni filled my mouth with a swanky opulence that comes when you blend elementals of the earth and the sea. It looked good and tasted even better. 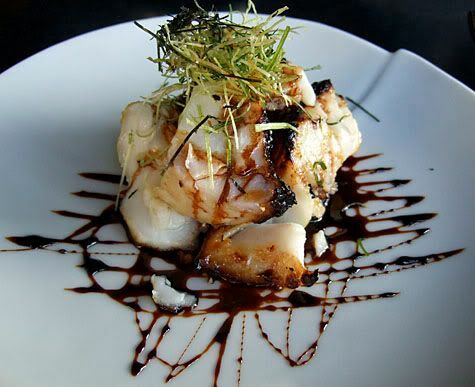 We decided to split their signature dish Grilled Black Cod, which is line caught bodega bay black cod marinated in denjang saikyo miso. It is dramatically presented with an expressionistic drizzle of a soy balsamic reduction and topped with fried leeks and tiny strips of dried laver. Holy mother of succulent fish with crisped chewy edges, this was so good that I almost hurt myself wolfing down the molten and voluptuously rich flesh, paying no regard to fishbones. 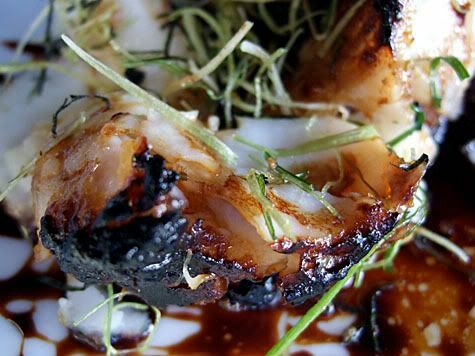 The chef uses a certain type of charcoal for grilling that imparts a haunting smoky flavor that infused the sugar in the marinade, forming a mouthwatering, caramelized crust and searing the flavors into the juicy delicate flesh. We shared a pot of premium dragon well tea, which has a subtle and refreshing taste and the menu claimed that it is used to refresh the body, fight viruses, control high blood pressure and lower cholesterol. After a day like today, how could we not order this? 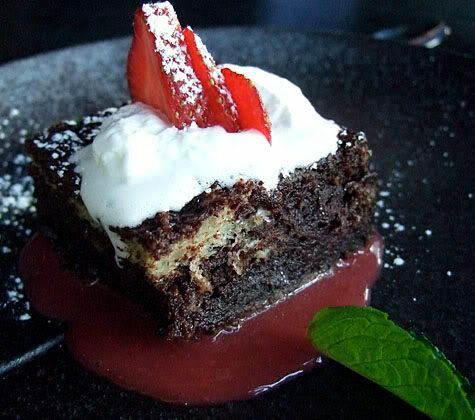 Despite the fact that I had a creme brulee at lunch, I found myself ordering the Chocolate Layered Brioche served in a nigori sake strawberry sauce and fresh strawberries. I think I was too full and just couldn’t appreciate this dish. It seemed dry and flavorless. 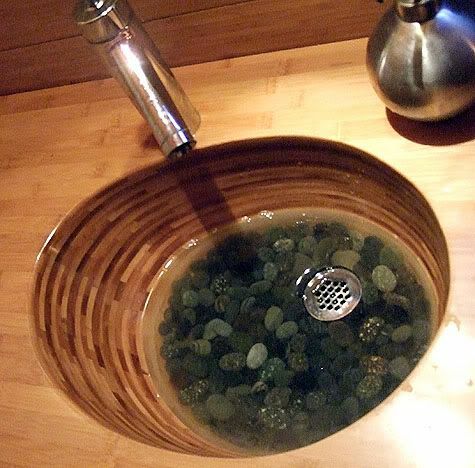 I don’t normally photograph bathrooms, but the riverstone based sink made of layers of contrasting wood was beautiful and intriguing. The bathroom had a warm glowing zen atmosphere. Wow, everything looked so beautiful, even the plates. And your descriptions made it sound heavenly. Didn’t realize they had such fancy restaurants in the Richmond! Singleguychef, it’s definitely worth a visit, and they serve happy hour 6-7 in the restaurant too (not just in the bar). Hi FH – Looks like they do a good job pulling off the “fusion” thing…..something that’s deceptively hard to do. Is the charcoal used for grilling Binchotan? It really adds a wonderful flavor to food. Looks lovely! I’ll definitely try to check it out.